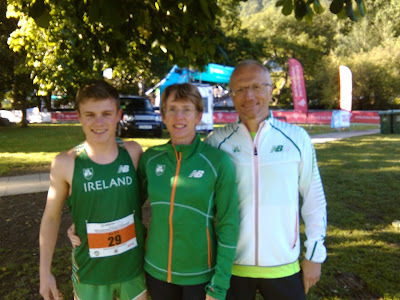 Alex Hunter competed in the international youth mountain running championships in the Czech Republic last weekend. The course was uphill only over 4.8k and temperatures soared to over 30C during the race to make it even more challenging for all the athletes. Alex has been in great form recently so it was no surprise when he led home the Irish team in 21st position in a highly competitive race that saw 8 athletes from Turkey in the top 10. He now plans to turn his attention to the 3k steeplechase for the rest of the track season and has his eye on breaking his own club junior / senior record. Alex is pictured with his proud parents Ann and Derek.